I’m not quite sure when, where, or how I developed a keen interest in the issue of governance in India. Maybe it was from my love for social science classes in school or my father’s interest in politics and development. Perhaps it was the inspiring texts I read as part of my political science degree in college, or experiencing Delhi University elections at its best (and worst). Maybe it was witnessing the chaos caused by the Commonwealth Games in Delhi or being part of the Right to Information movement in my own small way. After a year and a half working with some of the most inspiring women I have met in my life, I was undecided about what comes next. For over a year, I had primarily worked with 10,000 women from Below Poverty Line families, most of whom lived in houses made of mud but had the brightest smiles and most formidable spirits. They fought patriarchy every day, sometimes consciously and sometimes unconsciously. They were housewives, farmers, cattle rearers, and small-businesswomen. Each woman was seemingly powerless, but when united, they could bring District Magistrates to the streets. They fought for their right to work, right to food, and right to entitlements. About 2,000 of them even stood for local government (panchayat) elections and over 1,000 of them won on shoe-string budgets against upper caste, male candidates known for their money and power. My experiences galvanizing these 10,000 women taught me the importance of scale for driving sustainable change and impact. Having previously worked with large-scale nonprofits, political organizations, and research institutes, I had a fair insight into the advantages and limitations of each of these kinds of institutions. Government definitely had the advantage of achieving large-scale impact in a short span of time, but I didn’t see myself in a bureaucratic set up, and so I never considered the civil services. This is when a friend told me about SocialCops. He introduced me to one of the co-founders (Prukalpa), and I casually dropped by the office one evening. My conversation with Prukalpa left me intrigued. I was familiar with ICT4D, real-time monitoring, and open data, but I’d never heard of “data-driven governance” before. Further, SocialCops’ approach of working “with” the government attracted me. This meant I would be able to trigger large-scale impact across multiple sectors and geographies without having to compromise on creativity and informal work culture (which would be the case working “in” or “for” the government). It seemed like a perfect fit, so I applied and quickly joined the team. My first few days at SocialCops felt like I was in Mars. I had no idea what people were saying, with words like NoSQL, NodeJS, AWS, and SSH thrown around like they were natural language. In fact, when I overheard someone mentioning “Kafka” in the office, I thought they were talking about a book. I had no idea they were actually talking about “Apache Kafka”, the streaming platform. Despite numerous facepalm moments, what kept me going was my curiosity and genuine interest in exploring the way that data and technology can drive better decisions in governance in India. However, I found myself completely out of my comfort zone here too. Coming from a social science background, numbers scared me. To say I was overwhelmed by big data and CSV files, not to mention tech and data jargon, would be an understatement! However, this is exactly what made me push the boundaries I had set for myself. I started creating a tech and data dictionary and learned things I’d never imagined I would — from the basics of tech and Excel to how to use Inspect Element to create dashboard mock-ups. Letting go of my inhibitions at work also helped me foray into unexplored territories outside of work, such as playing football (a sport I had never played before) and trekking to Kheerganga in -10 degree weather with the team. An hour spent cooking on a chulha is equivalent to smoking 400 cigarettes. These chulhas cause the deaths of thousands of women every year. I had joined SocialCops to work with the government at large scale, and this wish came true immediately. One of the first deployments I got involved in at SocialCops was with the Ministry of Petroleum and Natural Gas. The Ministry is using our platform to track the implementation of Pradhan Mantri Ujjwala Yojana (PMUY) in real time. PMUY is a flagship scheme of the central government that seeks to give LPG (liquefied petroleum gas) subsidies to 50 million Below Poverty Line women in the next three years. This subsidy is so important because an hour spent cooking on a chulha (traditional open fire stove) is equivalent to smoking 400 cigarettes, and these chulhas cause the deaths of thousands of women every year. Access to LPG gas for cooking could solve this. Learn more about what our platform actually is and how over 150 organizations use it to make better decisions. Developing a real-time tracking dashboard to monitor the scheme’s overall progress and identify bottlenecks in its implementation. Using our data collection app Collect to capture photographs and geolocations for every LPG connection issued. Opening 10,000 new LPG distribution centers to ensure that every person in India had a center within 10 km. These centers had to be located to improve access for deprived, rural, and low-income populations, but every center also had to be economically viable. To figure out the best locations for 10,000 new LPG centers, we developed an optimization algorithm and geospatial data visualization dashboard for the Ministry. My first meeting with the Minister happened on a Sunday afternoon at Shastri Bhawan. We started by showing him the first iteration of the geospatial dashboard to plan locations for new LPG centers. We had first plotted the location of existing LPG centers, as provided to us by the Oil Marketing Companies, in order to identify which areas were still uncovered. I was taken aback when he asked us to zoom into Odisha (his home state) on the dashboard, then further into his district and village, to check if the locations for the existing distributors were accurate! In fact, he even made a round of calls to surprised distributors on that Sunday afternoon and pointed out a few inaccurate locations. I had worked with bureaucrats and politicians before, but I’d seen few leaders using data and technology like this, let alone spending six hours vetting the smallest data points. I was amazed. Right then, it was decided that over 17,000 LPG distributors would download our data collection app and capture the geo-location of their distribution center, all so we could plot accurate locations and identify the best locations for new centers. I had worked with bureaucrats and politicians before, but I’d seen few leaders using data and technology like this, let alone spending six hours vetting the smallest (which often turn out to be the most crucial) data points. I was amazed. I soon started getting over 100 calls a day from LPG distributors from across the country, asking about everything from their username to basic troubleshooting. These calls continued for four to five months! At the same time, I was learning how to deal with the massive scale of the scheme and the involvement of multiple stakeholders — the Hon’ble Minister, Ministry of Petroleum and Natural Gas, and the three Oil Marketing Companies and their distributors. Navigating all of these organizations’ structures and processes to get even the most basic data, as well as exploring each of their perspectives and concerns through dozens of meetings, gave me a bird’s eye view into how complex decisions can be in this domain. Through these meetings, despite being the youngest members in the room, we were always treated as trusted advisors rather than mere service providers. One of my favorite moments at SocialCops happened during our work for this scheme. I was visiting a village in Uttar Pradesh to pilot using Collect to capture photographs of beneficiaries getting LPG connections through the scheme. It’s one thing to hear the stat that one hour of cooking on a chulha is equivalent to smoking 400 cigarettes, but it’s quite another to see smoke-filled black walls inside people’s houses. Having the ability and access to bring voices and learnings from the ground directly to a Union Minister, who in turn started policy changes based on those observations, is something few companies (let alone a startup of 20-somethings) can claim to achieve! To see our app being deployed in such a context, where the data being collected would ensure that safety guidelines are followed and subsidies go to the right beneficiaries was truly invigorating, and it just reiterated the power of data and tech in driving better governance. I joined SocialCops to drive large-scale impact. Here I am, ten months later, working closely with top bureaucrats on a deployment that will affect 50 million Below Poverty Line women. From capturing primary data from the most remote regions of India to tracking national schemes and aiding village-level micro-planning, the variety of use cases for data and our platform continues to amaze me. I love that I don’t have to pick between working with government, nonprofits, philanthropic organizations, or companies. Instead, I get to work with all of them and gain insights into how each kind of partner uses data to make decisions. I love that we have a diverse team with varied interests — from engineers interested in politics to field managers helping with UI/UX design. I love that, despite having no prior knowledge or experience working with data and technology, I’m now comfortable with terms like “web services” and “staging environment”. (I think) I know the difference between SQL and NoSQL databases and the full form of AWS. In fact, my tech dictionary (read “jargon book”) was just added to our on-boarding checklist for new hires! Read more about our work with the Ministry of Petroleum and Natural Gas in powering Pradhan Mantri Ujjwala Yojana using data intelligence here! We’re always on the lookout for passionate people to join our Deployment Management Team. 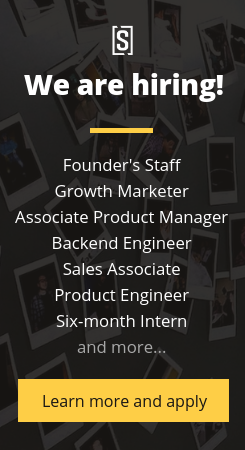 Check out open positions here!